Pat Broussard answered a knock at his door in 2002 to find two Mormon missionaries standing there. What happened next surprised his visitors. By the time they left, Broussard had begun an unusual faith journey. And missionary Andrew Blackwell missed on winning a convert but gained a lasting friend. 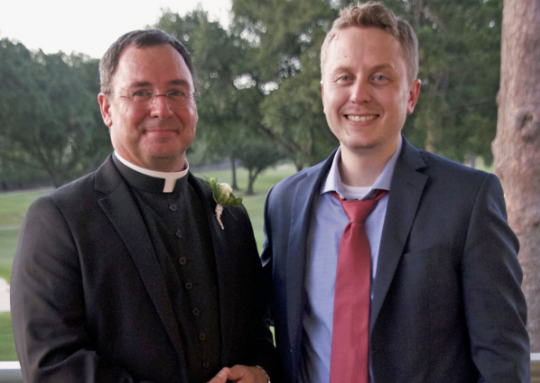 On May 27, Broussard, 56, and Ryan Hallford were ordained Catholic priests by Bishop Robert Muench, of the Diocese of Baton Rouge. In the audience was Blackwell, who returned to Louisiana from Utah to offer support. When they met 15 years ago, Broussard was a married father of two. His wife, Aminthe, had been a teacher before deciding to enroll in LSU’s Paul M. Hebert Law Center. Broussard was in New Iberia getting the house ready to sell to join her in Baton Rouge when the Mormons came knocking. Broussard admitted to the missionaries that he was not especially devout. They challenged him to explore a deeper relationship with God. Although they wanted him to do so through the Church of Jesus Christ of Latter-day Saints, Broussard said he never felt pressured.